My visiting daughter and I were sitting in the computer / garden / bird-viewing room when something large swooped in over the house and landed on the fountain wall. As soon as it rested we could see that it was a largish, brown and white hawk. We were both so shocked neither of us could locate a camera although mine was right at my elbow. I may have seen this hawk before. Last year one was sitting on the top of the bird feeder hook for the longest time. Just couldn't get him in focus. Again, on Halloween night this year one was sitting on the top of the utility pole in front of my house. There was time for my son-in-law to run in and get my camera. He did a great job of snapping off a few pictures. This was identified as a Coopers Hawk by a neighbor. I have no idea if it is the same hawk, though. The "Big Storm" missed us and we only received an inch or so of snow while the East Coast was hit with two FEET! But it was enough here to give the garden a winter look. I love to check out the critter footprints in the snow the morning after even an inch of snow. Here I identified mice, rabbit, and squirrel. Could be something more exotic some day. As we drove East on a road away from the new Humbug Marsh Wildlife preserve, we noticed a coyote loping through a yard along the road. He looked to be well-fed and rather larger than others I have seen trotting along the roadside in the past. Given the wildlife in the Marsh I wonder why he would leave that buffet. Mother always said when she saw a "Snowbird" (Junco) there would be snow within 24 hours. This little guy has been around the last 2 days and, sure enough, we have had snow the last few evenings. I know this doesn't make sense scientifically, but it happens so often it makes one wonder. This Nuthatch and a pair of Chick-A-Dees are also winter visitors I never seem to see in summer. I am being careful about feeding the birds. A neighbor will take over with my left-over seed cakes while we are in Florida. I leave a few days between feedings in the seed feeder to be sure the other birds have other places to get food. This is the first orchid I have ever had bloom for me. I rescued a couple sad pieces of orchids from under a neighbor's bushes when we were cleaning up her property (now in the hands of her children who live far away). Needless to say I am thrilled and hopeful that I finally know how to care for these plants. Another one that was a gift is near to blooming also. Those two pots will be going back to Florida with us. I don't know if I will leave them there or cart them back to Michigan again in Spring. Isn't that a sad sight? Everything looks so cold and dead, but it is all just waiting for Spring. The only signs of life are the rabbits, squirrels, and the winter birds at the feeders. A couple more weeks, though, and I will be gardening in Florida again. I want to look back on this picture and remember what is going on in Michigan. I may take ONE more photo if it snows before we leave. November 21...that's right. I have my sun room door open and was sitting on the deck in just a light sweatshirt. The bird feeder has been moved closer to the house in preparation for winter, so I don't have to slog out in the snow to fill feeders. 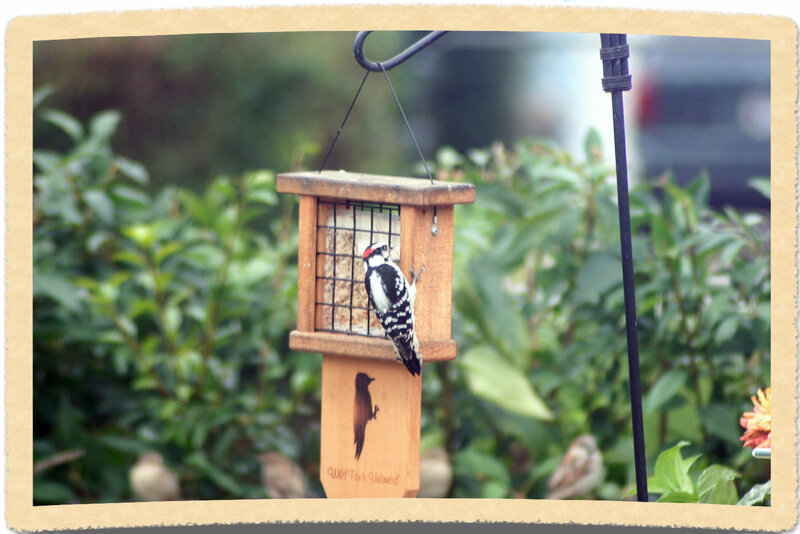 The woodpecker couple have been at the suet feeder constantly. What a delight. They don't seem to care if I am there or moving about in the sun room they just stick to it until they are ready to leave. The chickadees and nuthatches, on the other hand, are so skittish that if I even THINK "camera" they are gone. They each came in briefly while I sat on the porch but I wasn't even breathing. Gone in a flash. Oh well, if it were easy it wouldn't be a challenge. The Goldfinches are sporting their winter colors but still visiting several times a day. Thanks to the long spell of warm weather my garden is prepared well for winter. All of the planters, and garden decor is in the garage. All of the annuals have been removed and the perennials cut back to their winter size. The roses are still uncovered because, believe it or not, they are still blooming. 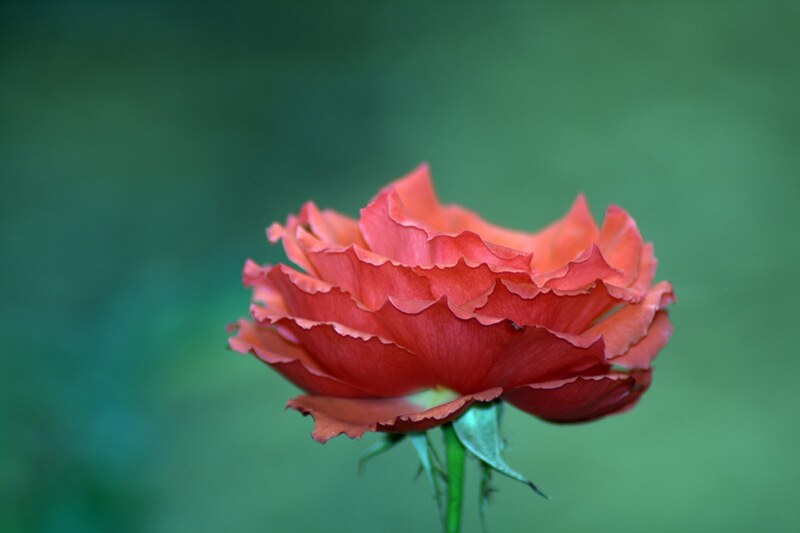 I took the camera outside to get a photo of what I assume will be the last rose of summer. Snow is predicted for next week sometime. While I was out there both the Chickadee and the little skittish Nuthatch came in to the feeder. Snap, Snap! What a strange year this has been, weather-wise. This is a phrase I am hearing so often this year. It is early October and snow is all around us. We MIGHT have a surprise Indian Summer but I certainly don't count on it. I still have bulbs that need to be replanted and, perhaps, some new special tulip bulbs from a friend. I suspect that the cold has driven away my pair of hummingbirds. I read the species named with migrating birds. They may be gone already. The woodpeckers have found the new suet-cake holder, thank goodness. I really think the expensive suet cakes are not appreciated by the sparrows. They only eat that when their feeder is empty. The styro cones are ready and waiting for the roses but they are still trying to bloom. 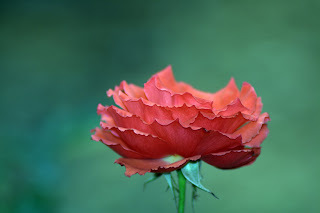 I can not cut back a budded rose cane. When I have totally given up on decent weather I will get out and cut or pull the annuals; zinnias, Cardinal flower vine, nasturtiums and the rogue tomato. More about that later. 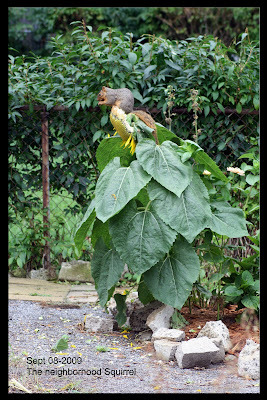 I was pretty sure it was one of the neighborhood squirrels who was feeding on the biggest sunflower. I was lucky enough to catch him on the flower today with my camera. My granddaughter was here and delighted watching him eat. 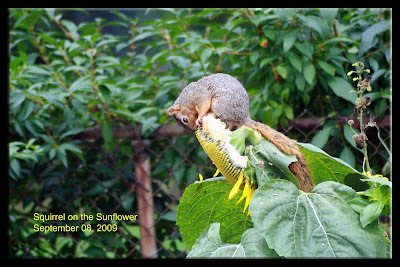 That is why I planted sunflowers...for the wildlife. These certainly aren't the best of photos but they are the first I have been able to take of the little hummingbird visiting my flowers. Last spring I ordered a seed collection from Renee's Garden specifically for butterflies and hummingbirds. I had almost given up on seeing flowers on the Cardinal Flower vine, but a few days ago some started to appear...and so did this hummer. The colors indicate male, but not ruby-throated, I don't think. While he was here he visited the roses, sunflowers, the neighbor's Althea bush, and then disappeared. He actually rested on the fence for a few seconds but focusing on the little guy is a real challenge. I shall be waiting and watching. This is the garden on the first of September. The sunflowers (those on purpose on the right and the volunteers from the birdseed on the left) and amazing. The sunflowers were great to plant for the children. The zinnias are bright in the bed at the back and the ones for the butterflies by my roses are thick and attractive. So far I have only seen those white common butterflies and a few Monarchs. I think there was a black one with some markings yesterday but I didn't get a good look at all. The most dramatic change in my garden has been the sunflowers. They are 8 feet tall at least and the heads just get bigger every day. I missed the photo of my granddaughter looking up and watching a butterfly working away for the longest time pollinating one of the heads. Abby is spritzing the roses but you can plainly see the Magic Carpet Zinnias by the path and the trellis of Cardinal Flower. She is blocking the carpet of Nasturtiums beyond the zinnias. All three varieties came in a package of plants especially for butterflies and hummingbirds. The Cardinal Flower Vine that I thought would never have blooms finally flowered with tiny delicate blossoms that look just right with the soft, lacy leaves. It certainly is attracting butterflies. I haven't seen the hummingbirds around it, but they are close. Speaking of the hummingbirds, one is visiting the oriole feeder regularily. I don't know if it is the orange color of the feeder, the water in the base, or the grape jelly he is after but he stayed around long enough his second visit today that I could see the irridescent green of his body. Another bird to look up. Even with the tripod set up and the Canon in place with the big lens, I am not hopeful of catching him, but I will certainly try. What a bright surprise House Finches are when they land on my feeder. They are not unusual, but just such a bright spot among the sparrows. Some folks say these are just regular crows with red on the wings, but the Red Winged Blackbird is ever so much more polite on the feeder than the "bully birds". There is a softer call from him, too. Although the Cardinals may eat from the feeders, they most often seem to be cleaning up after the messy sparrows. This bright fellow has a brother with no feathers on his head. I read that there are some kind of mites cardinals get that strips away feathers on their heads. Also read that it isn't serious and the feathers grow back. I still have two areas under tarps waiting for me to have what it takes to tackle them. Rather like the farmer who lets a field or two go fallow for a season. It just wasn't worth it to fight the weeds (and chiggers). Don't let anyone tell you there aren't chiggers in the North. Today I finished weeding and adding soil to the vegetable Square Foot Garden. A little late for this year's spring and summer veggies, but the fast growing root vegetables will be fine into the late fall. The path needed raking after the weeding of the last week or so. With that done I took the patio broom and actually SWEPT the block path in the back and the self-leveling gravel in the rest of the garden. Whew! I turned it over to the birds for a while and will go out again this evening. ALL of the mulch is down in the rose-zinnia-trellis garden and the table is set for lunch with a friend tomorrow. Next big chore is taking up the iris. I have started cutting the spent flowers and cutting back the leaves (and weeding). This week I will take the pitchfork and lift all of the iris rhizomes and soak them for a minute or two in a solution of Murphy's Oil Soap to kill any nasties, although I don't see any evidence of slugs, or borer. I also have to get their new bed dug up and prepared. I want to trade some of the blues and purples for some yellows the neighbors have. Female Oriole checking the orange. Female Oriole dipping into the grape jelly. Female Oriole feeding fledgling on the ground. I bought this Oriole feeder last Tuesday (July 7) and filled it a day or two later in hope of finally getting some good photos of the Orioles I know are nested in a neighbor's tree. Well, I waited and waited...checked the nectar, orange ($.69 cents for ONE orange!!!) and the grape jelly dishes. The lady at Wild Birds Unlimited (see previous post) told me grape jelly, but I thought marmalade would be better. She said that ONLY grape jelly was recommended. Today I have seen a female Oriole out and about feeding a fledgling, first on the power line, and then on the top of the hook holding the feeder. But every time I got to the camera they would vanish. I could still hear their soft trilling, though. I moved the tripod closer to the door-wall and closed the glass. It would be less than PERFECT photos, but I would'nt spook the birds off, at least. Soon I was rewarded with the above photos. YAY. Now to catch the gorgeous male at the feeder. When I moved to this house 8 years ago I brought a large cement birdbath with me. Over the years I have added some feeders and other birdbaths, mostly from the hardware store. This year I filled out a questionnaire to have my yard designated as a wildlife habitat. The plaque is in the mail. My granddaughters spend hours watching the birds (rabbits, squirrels, etc.) with me and lately their parents have spent a few evenings watching the birds, too. 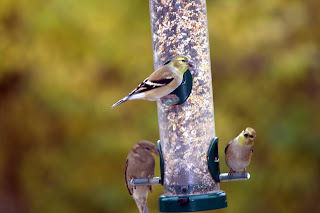 The parents even showed a desire to put some feeders at their house, only 10 blocks away. So...a few days ago was my daughter's and my shared birthday. Lunch and a shopping trip together is how we usually celebrate. This time I suggested a college town not too far away for lunch. I knew there was a Wild Birds, Unlimited store there. 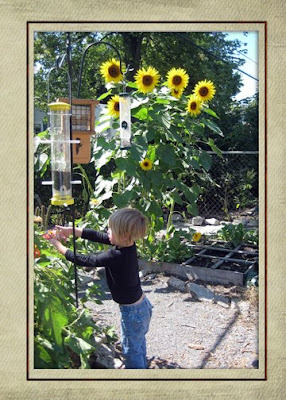 Of course, we had to get seed (non-sprouting) for each kind of feeder, too. There were a number of Wild Bird Unlimited publications for us and for the children as well, and a special Oriole feeder for me. We went back to my daughter's house after lunch and her husband went right to work getting the garden by the patio and door-wall all set up. Within the hour a bright finch had found the finch feeder. By this morning they had plenty to watch, Jays, Cardinals, Finches, Sparrows and more. The girls and their parents have a little viewing area set up with chairs and table in the shade of the big 42 year old evergreen. Photographing their birds can't be far behind. I HAVE to get one of those Advanced Pole Systems for MY yard. I have 3 of the regular hardware store hook and pole systems but, now I want the better one.